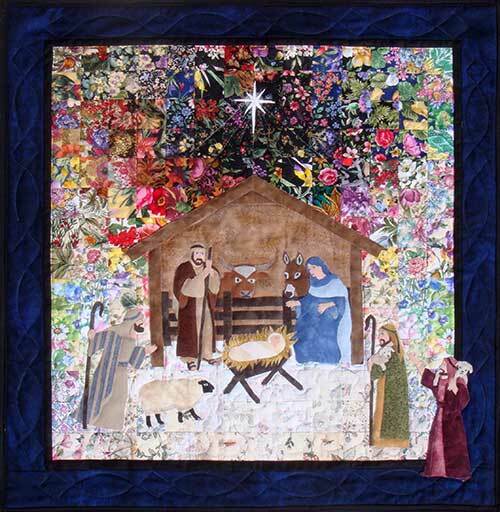 ‘Silent Night’ Watercolor Quilt Kit …Holy Night! Hear the lowing of the cow in the stable as he watches this scene unfold. The shepherds are amazed to visit the Christ Child lying in a humble manger bed in Bethlehem! Designed by Mim Schlabach for Whims Watercolor Quilt Kits. Size is 21" x 21" without border. Now is the time to make a new decoration — early! Why not start an heirloom tradition you can use year after year! Give one as a gift that will keep on giving!! All kits include: Dark, medium, and light die-cut watercolor fabrics, necessary applique fabrics and patterns, along with detailed instructions and a color photo. Skill Level: Advanced Beginner.